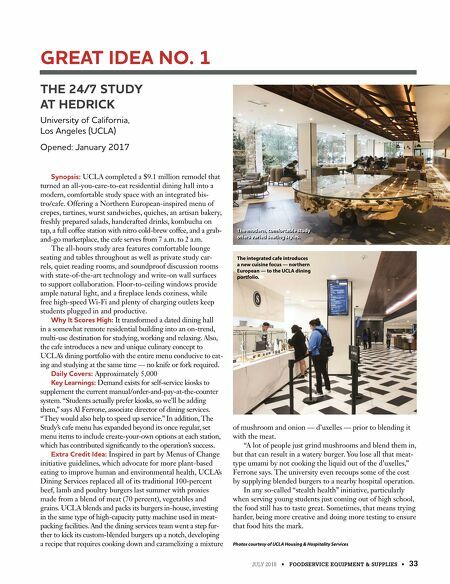 JULY 2018 • FOODSERVICE EQUIPMENT & SUPPLIES • 33 THE 24/7 STUDY AT HEDRICK University of California, Los Angeles (UCLA) Opened: January 2017 Synopsis: UCLA completed a $9.1 million remodel that turned an all-you-care-to-eat residential dining hall into a modern, comfortable study space with an integrated bis- tro/cafe. Offering a Northern European-inspired menu of crepes, tartines, wurst sandwiches, quiches, an artisan bakery, freshly prepared salads, handcrafted drinks, kombucha on tap, a full coffee station with nitro cold-brew coffee, and a grab- and-go marketplace, the cafe serves from 7 a.m. to 2 a.m. The all-hours study area features comfortable lounge seating and tables throughout as well as private study car- rels, quiet reading rooms, and soundproof discussion rooms with state-of-the-art technology and write-on wall surfaces to support collaboration. Floor-to-ceiling windows provide ample natural light, and a fireplace lends coziness, while free high-speed Wi-Fi and plenty of charging outlets keep students plugged in and productive. Why It Scores High: It transformed a dated dining hall in a somewhat remote residential building into an on-trend, multi-use destination for studying, working and relaxing. 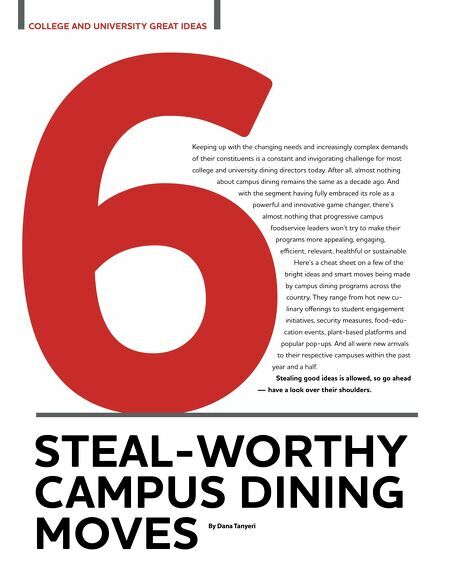 Also, the cafe introduces a new and unique culinary concept to UCLA's dining portfolio with the entire menu conducive to eat- ing and studying at the same time — no knife or fork required. Daily Covers: Approximately 5,000 Key Learnings: Demand exists for self-service kiosks to supplement the current manual/order-and-pay-at-the-counter system. "Students actually prefer kiosks, so we'll be adding them," says Al Ferrone, associate director of dining services. "They would also help to speed up service." In addition, The Study's cafe menu has expanded beyond its once regular, set menu items to include create-your-own options at each station, which has contributed significantly to the operation's success. Extra Credit Idea: Inspired in part by Menus of Change initiative guidelines, which advocate for more plant-based eating to improve human and environmental health, UCLA's Dining Services replaced all of its traditional 100-percent beef, lamb and poultry burgers last summer with proxies made from a blend of meat (70 percent), vegetables and grains. UCLA blends and packs its burgers in-house, investing in the same type of high-capacity patty machine used in meat- packing facilities. And the dining services team went a step fur- ther to kick its custom-blended burgers up a notch, developing a recipe that requires cooking down and caramelizing a mixture of mushroom and onion — d'uxelles — prior to blending it with the meat. "A lot of people just grind mushrooms and blend them in, but that can result in a watery burger. You lose all that meat- type umami by not cooking the liquid out of the d'uxelles," Ferrone says. The university even recoups some of the cost by supplying blended burgers to a nearby hospital operation. In any so-called "stealth health" initiative, particularly when serving young students just coming out of high school, the food still has to taste great. Sometimes, that means trying harder, being more creative and doing more testing to ensure that food hits the mark. Photos courtesy of UCLA Housing & Hospitality Services GREAT IDEA NO. 1 The modern, comfortable study offers varied seating styles. The integrated cafe introduces a new cuisine focus — northern European — to the UCLA dining portfolio.